Reclaim control over your inbox! Behold, the “Mute” feature in Gmail. 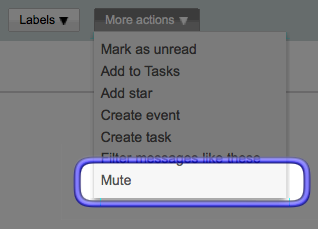 Found in the “More Actions” menu of Gmail, mute allows you to effectively silence long, irrelevant conversation threads. [Muted …] messages added to the conversation bypass your inbox so that the conversation stays archived. If your address appears in the to or cc field, though, the conversation will pop back into your inbox ready for your attention. This helpful nugget of wisdom has been brought to you by the letters A, G, and the number 8. And also by google’s help pages.